We met through mutual friends back in 2009 and talked via text and social media before I went to watch Dave play soccer one day and from there we organised a proper first date. We knew it was love when we realised we could no longer picture our lives without each other. We got engaged on a beautiful weekend away at Château Elan at The Vintage in the Hunter Valley. We had an amazing three course dinner at the restaurant on grounds then went for a walk down to the rotunda on the greens of the golf course where Dave had organised for it to be set up with champagne and candles. Here he got down on one knee and asked me to marry him! We both knew we wanted to get married in the Hunter Valley. We love the scenery and atmosphere of being in wine country and Chateau Elan allowed us to have ceremony, reception and accommodate our guests all in one place. As we also got engaged there, it held a special place in our hearts. 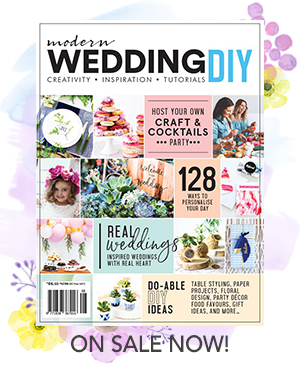 I would describe our wedding theme to be 'Vintage Chic'. We got married in the Carriage House at The Vintage in the Hunter Valley. Our reception was held in the Founders Room at Château Elan, The Vintage. We had three bridesmaids and three groomsmen. I have three younger sisters who all stood by my side and Dave had his three best friends standing beside him. I wore an ivory Maggie Sottero gown with sweetheart neckline that was fitted to the waist then fell in layers of tulle to the floor with a small train. It was embellished with small crystals and tulle flower on the waist and crystals that came down into a ‘v’ shape at the back of the dress where it laced up. It was purchased from Belles & Beaux in Newcastle. I didn’t really have much inspiration to be honest, I found a picture of the dress when I first started looking at gowns and tracked down where I could try one on, although I still tried on a few different styles as soon as I put it on I knew it was ‘the one’! We had David Austin roses as our main flowers but had a mix of ranunculus, roses and a few others. My inspiration was soft and romantic. My bouquet was mostly pink with some peach and whites and the bridesmaids had a mix of white and creams. We wanted to create a very soft and romantic feel for the reception so each table was adorned with lots of flowers in difffernt sized vases and lots of candles. We decided to do something a little different and make a statement in the room so we had a big floral chandelier made of babies breath in the centre of the room. It looked magnificent! Peonies Floral Designer did all the flowers and reception decorating. We had a three course sit-down meal and each meal was alternately served to guests. Entrée: poached chicken salad with gem lettuce, crisp bacon, parmesan crumbs and aioli OR goats cheese and pumpkin tart served with pear rocket salad and agrodolce dressing. Main: Roast corn fed chicken breast with soft herb mash, baby carrots, onion jam and a tarragon jus OR panko and rosmary crusted lamb rack with soft polenta and ratatouille. For dessert we had wedding cake which was a ‘naked’ chocolate mud cake with vanilla bean buttercream served with cream and berry coulis. We decided on a cookie bar for our bomboniere. It was something different and fun and super delicious! We had a choice of 3 different flavours and our guests could self serve and take home, but most people couldn’t wait! 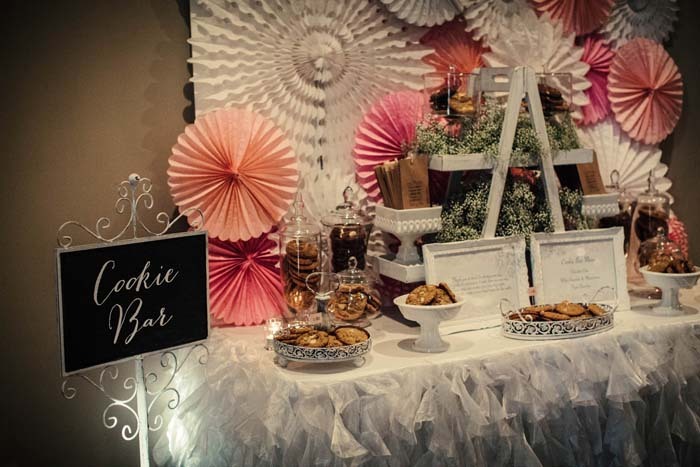 Cookie bar and cookie bar styling was done by Wild Roses Sweets and Styling. So many amazing memories, but my favourite was probably when the Carriage House doors opened and I saw Dave standing at the end of the aisle with his head in his hand and tears in his eyes! Candice went above and beyond to capture our special day and we were absolutely thrilled with the outcome when we recieved our pictures! We stayed in a beautiful spa suite at Château Elan. The ceremony music was played by one of my best friend's on piano and was accompanied by his friend who played violin and togther they played instumental versions of 'A thousand years' by Christina Perry as I walked down the aisle, then 'Halo' by Beyonce as we signed the registry and 'Sky Full of Stars' by Coldplay as recessional. Our first dance song was 'Thinking out Loud' by Ed Sheeran. We spent 10 days in Hawaii!